Cleans and sanitises all surfaces. Removes lime scale. Kills odour producing bacteria. •Leaves a fresh fragrant atmosphere. •Independently tested to BS6471 QAP50. For the regular cleaning of ceramics, painted surfaces, stainless steel, floors, all non-porous surfaces in hotels, sports complexes, conference centres, institutions etc. Use throughout the washroom on washbasins, mirrors and stainless steel urinals. Suitable for poolside cleaning. 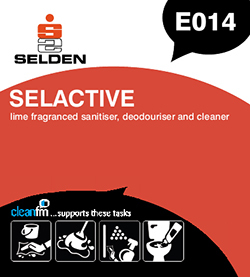 Dilute SELACTIVE 1 part to 40 parts warm or cold water for cleaning walls, floors, worktops etc. Use neat for limescale removal on toilets, urinals and poolsides. Brush and rinse off. Apply SELACTIVE to cleaning cloth and wipe away scale and body fats in showers and sinks, then rinse off with water. Composition An acidic blend of biocides and cleaners, incorporating a fresh perfume.